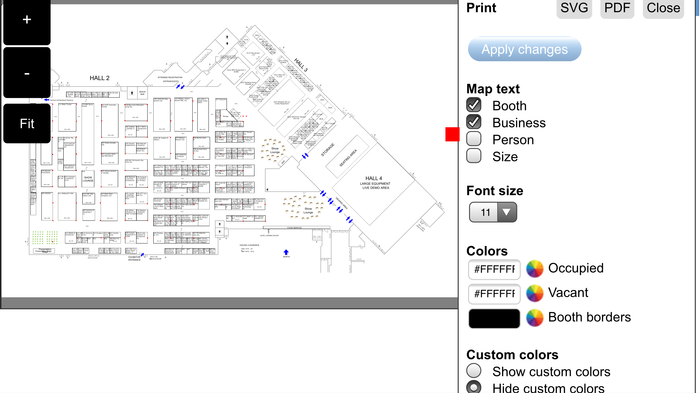 A tradeshow manager called and asked how he can print his map in black and white on a regular 8.5 x 11 sheet of paper. We asked why he doesn’t just export the pdf and choose black and white on his printer settings. He had a great answer: He needed visible booth borders. The booths have white borders. This works well on the screen, so long as you have a colored background. When printing, this background color needs to be light enough to allow you to see the text inside the booth showing the number and business name. As it turns out, light colors in black and white are hard to see in print. The manager need white booths with black borders. More contrast! The fix: We added a setting to let you choose the booth border color. For black and white printing, choose white booths and black borders. It’s a simple solution to a simple (but crucial) problem.